Fun fact: More than half of parents used typewriters, while almost all teens use either a desktop, laptop, or tablet computer. Feel old yet? I'm partnering today with BlogHer and Microsoft to tell you about the time I almost died of embarrassment in science class. Back then, our parents didn't have email to communicate with teachers, so we had to wait until school started to get our supply lists. This stands in stark contrast to back-to-school shopping with my kids now, for which I'm emailed a lengthy supply list in July. It's my own fault if I ignore it and wait until the last possible second to elbow other parents in the aisles over the last new box of crayons in September. Not that I would do that. Ahem. So first, my mom would take us out to buy new clothes. They were mostly intended for the fall and winter, but I'd be sure to wear something completely seasonally inappropriate on the first sweltering day of school, just because it was new. That's why, on the first day of 7th grade, I distinctly remember sitting in science class, wiping the sweat from my brow onto the sleeve of my neon paint-splatter thigh-length sweatshirt (paired with neon yellow leggings, of course) in the 986-degree classroom, diligently copying the school supply list from the chalkboard. I wrote them out by hand, naturally, unlike students these days who can snap a picture of notes on the board or type them into their phones. Maybe that’s why parents and teens agree that software and online tools can actually make it easier to communicate and collaborate with classmates or teachers (91% and 94% respectively). Just then, the teacher started to erase the list - I am a huge nerd (was, I mean I was a huge nerd) so my hand shot immediately into the air. Reading from my list, I requested some clarification. After all, this was my only opportunity to get the supply list, and WHO KNOWS what would happen if I showed up to class without the proper number of folders for my Trapper Keeper (the popular 4-ton portable filing system which was mercifully replaced by convenient, 0-ton electronic filing systems). "Mr. Gardner, what's a divideer?" I asked. "I wrote down that we need divideers in four different colors, but I don't know what that is." The kids around me began to snicker, and Mr. Gardner gave me a look that I would later learn to classify as The Crazy Eyes. "Um, do you mean 'dividers'?" My face deepened to a shade of red usually reserved for third-degree sunburns, as my hooligan classmates' snickering erupted into laughter. Apparently my swirly, cursive E's had gotten away from me, and I lacked the benefit of spell-check's squiggly red line to alert me to my own stupidity. As you can imagine, I see a lot of those squiggly red lines these days. But at least I see a lot fewer pairs of neon yellow leggings. Launched earlier this year, they rolled out Microsoft Office 365 Home Premium and Office 365 University (for college students), which will help you and your kids stay organized, save time, and help make homework easier. It even has a school supply checklist template and back-to-school shopping budget - good luck finding four colors of divideers, though. 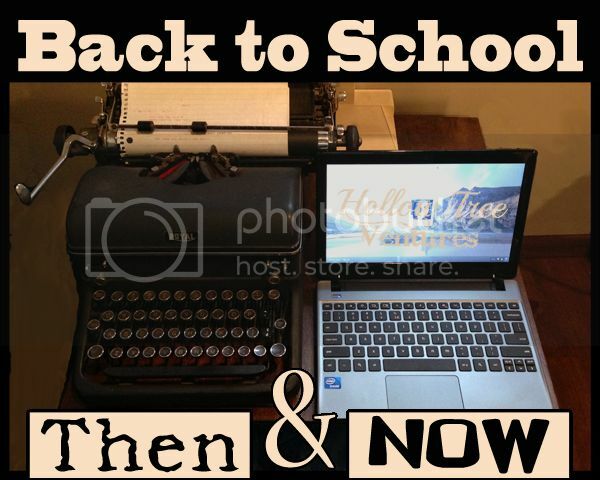 Check out their Back to School Throwback Sweepstakes for a chance to win a 1-year subscription to Office 365 Home Premium or a Surface Pro! The sweepstakes launches on August 15th (on Throwback Thursday!) and closes on September 27th. To enter, all you have to do is submit a “throwback” picture of yourself from back in the day. Submit your picture here on the Office Facebook page and share it on Facebook or Twitter with all your friends! (#tbt + #officebts). This post is sponsored by Microsoft, but all opinions, embarrassment, and spelling errors are my own. Labels: giveaway, school, technology, That Can't Be Right, There might be something wrong with my head., What did you say? When I started journaling again two years ago, I got that finger callus and hand cramp that always reminded me of September, when the muscles of school hadn't been flexed for months. I'll bet kids don't even know what that is now. Wow, that brings back memories! You're right, kids probably don't get that anymore - not even on their fingertips for typing, because they do that all summer (just not for any useful purpose). I remember the long lines the first night of school to buy all the necessary implements! And I remember wearing a turtleneck and sweater just because they were new! I only wish I had been cool enough to have a paint-splattered thigh length sweatshirt with neon leggings! Don't feel bad. Divideers are actually really common in home schooling ...as far as I remember.